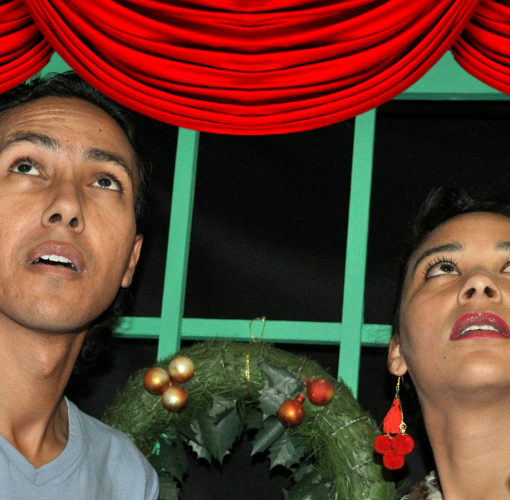 In this issue: Holiday wishes to all our patrons; start theNew Year by auditioning for the SA premiere of And Then What? on January 5 at 13:30; the Milly’s Awards celebrate two auspicious milestones. Read what’s happening at your community theatre. Just a few days to Christmas and holiday time and less than two weeks before this year is over. Can you believe it? It’s been a very busy year at the Playhouse and I think we all deserve a well-earned rest, although planning for next year is already under way. 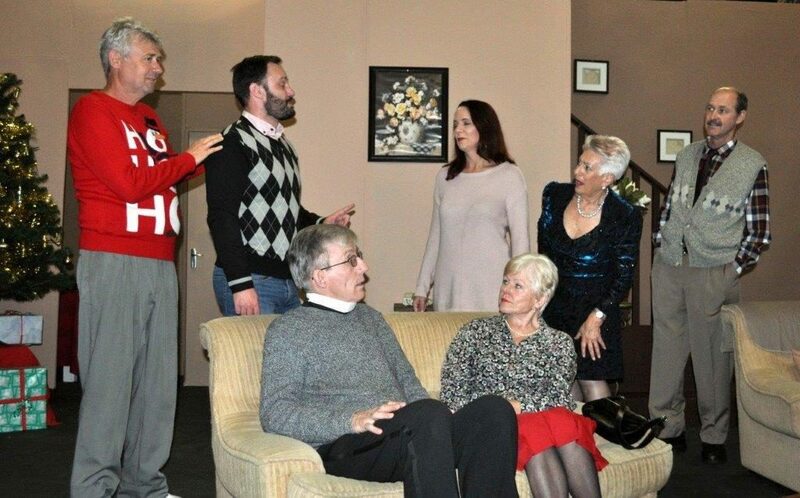 A huge thank you to the wonderful cast and crew of THE CHRISTMAS SPIRIT. We didn’t get the houses we would have liked but it had great revues and audience feedback from those who saw it and, most of all, it was great fun for all involved. Auditions for a brand new production take place on Saturday 5 January (see below for details) and then are followed by our first major event of the year – Milly’s Award Evening on Saturday 16 February. 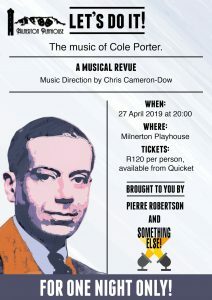 This will be a very special evening when, not only will we honour those who have excelled in our productions during 2018 but we will also celebrate the thirtieth anniversary of Milnerton Playhouse and the fortieth birthday of Milnerton Players Dramatic Society. 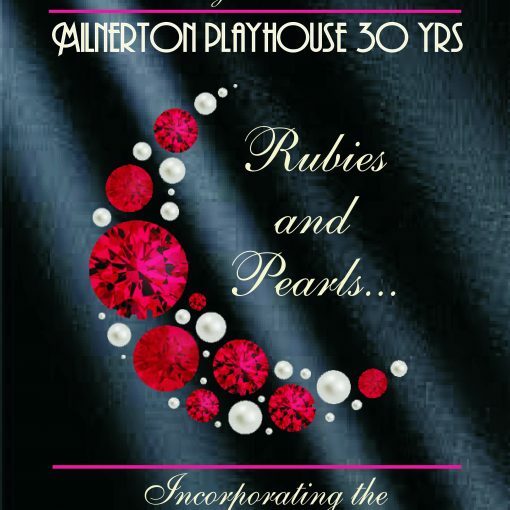 Make a note in your new 2019 diaries for PEARLS & RUBIES, our Thriving Thirty &Fabulous Forty celebration. The awards nominations and full details of the evening will be in the January Prattle so watch this space. Following close on the heels of our in-house awards and special anniversary evening is the CATA Awards which will be held at the Masque Theatre on Monday 25 February. The nominations of productions for all the participating Cape societies should also be made known soon. The first production of the year at the Playhouse will be the première of a home-grown production written by one of our members, actor, director and playwright, Werner Steffen. Werner made his very successful directorial début with the thriller DANGEROUS OBSESSION earlier this year and he has now written a full-length comedic drama with the interesting title, AND THEN WHAT? This will be produced at the Playhouse at the end of March and requires a cast of four plus a few extras. An audition will be held on Saturday 5 January. See audition notice below. If you would like to audition but will still be away on holiday on that date or on either of the further audition dates, please send Werner an e-mail to see if an alternative can be arranged. 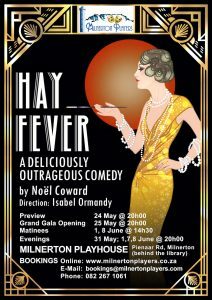 Our second production in 2019 will be the classic Noel Coward comedy, HAY FEVER. This will be directed by founder member, Isabel Ormandy, who is getting back in harness for directing again after a long absence from the Players overseas. An audition date will be decided and notified once Isabel returns in January from Australia, where she is spending the holidays with family. This is a usual light and frothy Coward comedy with several fun roles for males and females of various ages. July will introduce yet another new, young director to our stable, in the person of Lauren Haupt. Lauren has performed virtually every other role on stage and backstage. She’s shadowed an experienced director and also directed a couple of one act play readings for social evenings.We have now succeeded in persuading her to take on a full length production. A play has still to be decided but it will be a comedy. I must finish now and get on with my Christmas preparations, in between theatre-going, lunches out with friends and relatives and last minute Milly’s tasks like this one. We hope to see some of youat the audition for AND THEN WHAT? on 5 January and lots more of you at the Playhouse for our special Milly’s Awards and 30/40 celebrations on16 February. 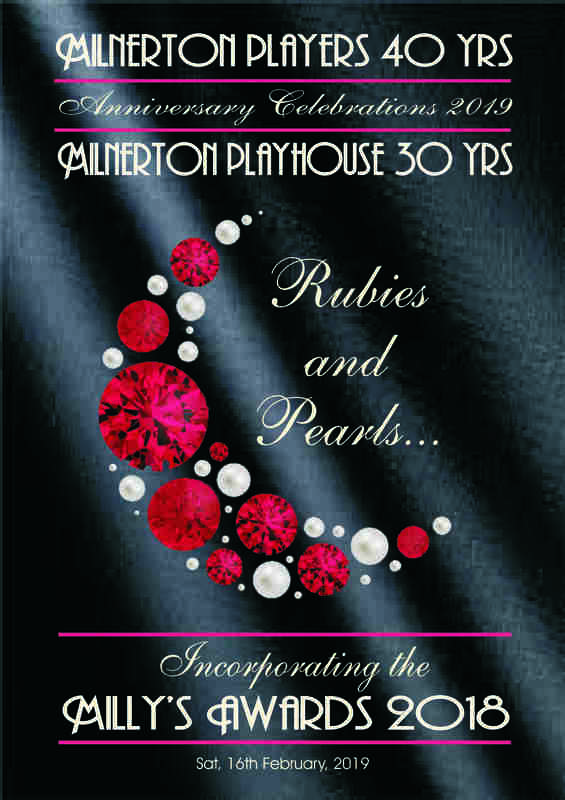 To all our members and friends from all of us at Milnerton Players, have a wonderful Festive Season. Please do take care on the roads if you are travelling and enjoy the holiday, however you choose to spend it. 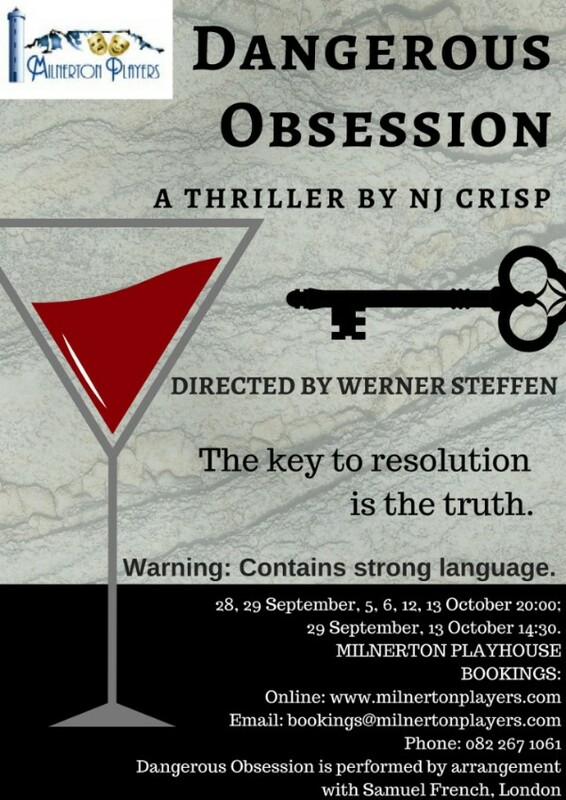 Following the Milly’s celebrations, The Milnerton Players will present an original play, written and directed by Werner Asher Steffen (director of 2018’s’Dangerous Obsession’ at the Playhouse) between 28 March and 13 April 2019. 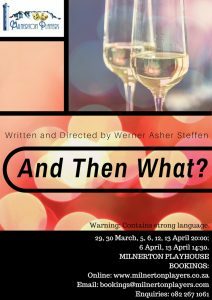 This production, called And Then What?, will be Werner’s third time writing and directing, following on Die Lappop in 1998 for the UJ Drama Festival, and the short play Before I Forget at the Playhouse in 2018. He is also no stranger to the stage as an actor, most recently having portrayed roles in Art (2017) and The Christmas Spirit (2018). In the comedic drama And Then What?, the playwright explores the theme of chasing a dream, sometimes to our own detriment, without giving much thought as to what comes next. Does thinking about what is to follow change our decisions or goals? Can we ever with certainty predict what is to follow? Does the question And Then What? necessarily require contemplation and a resolution? The piece further takes a look at the concept of what ‘fine’ means, and if it is a social construct to describe our physical and emotional state as we attain one goal and start to work towards the next. 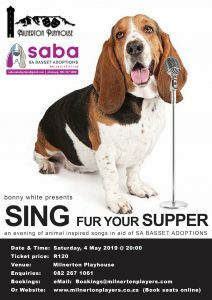 Set in a café-bar in the Cape Town inner city, the production requires a principal cast of 3 (2f, 1m), a supporting cast of 1 (1m) and a number of walk-on extras in non-speaking parts. We are inviting any and all interested thespians to attend auditions at Milnerton Playhouse on Saturday, 5 January 2019 from 13:30,with additional auditions being held on Tuesday 8 January from 19:00 and Saturday 12 January from 13:30. Please contact Werner at werner_steffen@yahoo.co.uk for further information. Rehearsals will take place on Mondays and Wednesdays at 19:15, starting on Wednesday, 16 January 2019. FIONA – a divorcée for some years. Somewhat ‘bohemian’ in appearance with a pseudo-feminist attitude.She longs for a deeper social connection, but in most instances ends up alienating the very people she wants to connect with, especially as her real concern for those around her is mistaken for her default condescension. She seems doomed to repeat her past mistakes by confusing physical for emotional connection and intimacy. To be played by an actress in the range of 28 – 35 of age. BRYAN – clean-cut and seemingly confident, Bryan lets his fear of rejection from family and friends, and especially the communities of which he is part of, render him incapable of pursuing a serious relationship, despite all reassurances and a serious advance from the very handsome (dare one say beautiful) Barman. He does not recognise what is in front of him as he is preoccupied with looking towards a future with foregone conclusions. To be played by an actor in the range of 28 – 35 of age. ANNE – a bride-to-be, she suffers from the stress and strain of arranging a ‘special day’ as she had always imagined it. She soon realises that her fiancé is perhaps not as committed to this day – and possibly their marriage – as she is. She seemingly takes a rash and harsh decision when she suddenly has to think about what comes after the wedding day. To be played by an actress in the range of 25 – 30 of age. BARMAN – having early on picked Bryan, himself attractive, as the object of his affection, we later on learn that his nervous and somewhat clumsy demeanour belies his strength and decisiveness in pursuing what he wants. To be played by an actor in the range of 25 – 30 of age. We would also like to invite and strongly encourage participation of society members who would like to be involved in or learn more about what goes on ‘behind the scenes’, helping with set building and painting, set dressing, assisting with lighting, costumes, etc.